As a student at the French Culinary Institute, I assembled a toolkit of kitchen gear for the intense program ahead of me. The things I was given included a chef's jacket, black-and-white checkered pants, a knife kit and a fire-red box that resembled the tackle box I used while fishing in Minnesota as a child. In the box were an oven thermometer, vegetable peeler, some spatulas, pastry bag and tips, tongs and much more. In my Japanese kitchen I've also put together a toolkit, with some similar tools and many that are specific to Japanese cooking. You may want to consider adding a few of these to your kitchen arsenal. They also make great gifts for your gourmet friends. 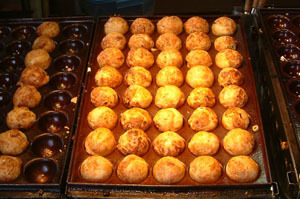 And as an added bonus, they can be used when cooking Western-style food as well as Japanese. I keep a wide variety of strainers in my kitchen, and they can be useful in picking delicate items out of boiling water or hot oil. When cooking in water or in stock, often meat and vegetables will give off a scumlike residue. 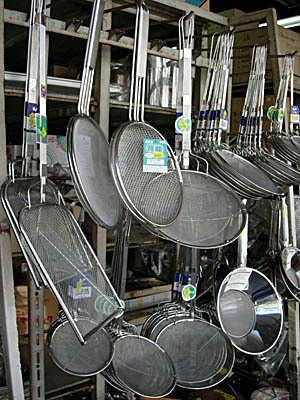 The fine meshed strainers are great for removing the residue while leaving the stock behind. My favorite is the strainer I use when cooking yudofu, a simple dish of cooked tofu in kombu dashi (seaweed stock). It was made by an old gentleman in Kyoto, and for some reason the tofu tastes better when I use his strainer. In culinary school one of our first tasks was cooking vegetables, and part of the process was to prepare a circular piece of parchment paper to place over the vegetables while they were simmering. The diameter of the parchment would be slightly smaller than that of the cooking pot, and the parchment would have a hole in the center to allow steam to escape. 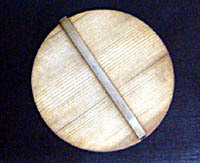 The Japanese use a similar technique with an otoshibuta - a lightweight wooden lid. The lid keeps the temperature at a simmer and prevents the liquid from going into a rolling boil. The lid also keeps everything submerged in the water, but it's light enough not to crush delicate items under its weight. Japanese graters are typically used to grate ginger, wasabi and daikon radish, and I reach for mine when I'm making garlic bread. Japanese graters generally have finely spaced teeth, and are relatively small, light and easy to care for. 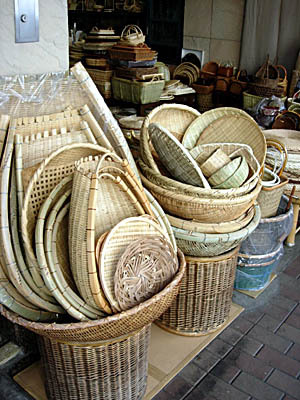 These are colander-like baskets made from bamboo, and they come in several shapes. They're used for a wide variety of tasks in the kitchen, including draining and rinsing as well as cooling or drying foods. I find myself using a flat, round zaru most often, as the large surface area allows hot food to cool off quickly. Also, the bamboo adds a nice Japanese touch to any kitchen. When making meat stocks in a French kitchen a key component is a bouquet garni, typically of parsley, bay leaf, thyme, and peppercorns. These aren't carelessly tossed into the stockpot - they're wrapped carefully in cheesecloth and secured with twine. In Japan I still use bouquet garni, but now I quickly stuff the ingredients into a disposable tea pack. You can also use them to infuse a stock with other herbs, and of course you can use them for their traditional purpose, stuffing them with dry tea leaves to be brewed in a teapot. A mandoline helps you to cut fruit and vegetables into thin slices, all with an even thickness. 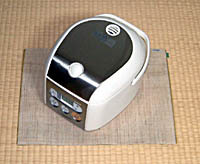 The Benriner mandoline is a Japanese model that more than lives up to its name ("benri" means "convenient" in Japanese). Compared to the French mandoline we used at culinary school, which was clunky and awkward to work with, the Benriner is compact, efficient and much more affordable. (My last one was purchased in Chinatown in New York City for less than $20.) It's easy to adjust the thickness of the cut, and you can get julienne cuts simply by switching the blades. 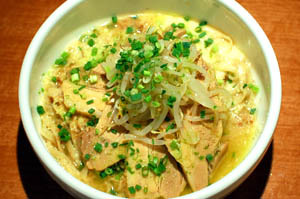 Recently Japan has seen a number of new cookbooks on the topic of how to prepare various dishes using your rice cooker. Whether it's a hearty chowder or steamed vegetables, just add the ingredients to your rice cooker and hit the start button. Beth Hensperger has written the ultimate cookbook on this topic (called "The Ultimate Rice Cooker Cookbook"). You may be surprised at just what you can cook in your rice cooker and how simple it is to do. 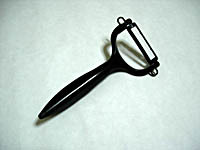 This is used exactly like a non-ceramic peeler, for peeling fruit, potatoes and so on. However, the cutting edge is made from ceramic, so it won't interact with the flavors of the food you're cutting. The ceramic edge also stays sharp much longer than a metal edge, and it will never rust. Kyocera makes a ceramic peeler that can be used by both lefties and righties. In my red toolbox was a pastry brush that looked like something an artist would use to paint a large canvas. At culinary school it was used mainly for delicate tasks in the pastry kitchen with melted butter, egg washes or finishing a fruit tart with an apricot jam glaze. 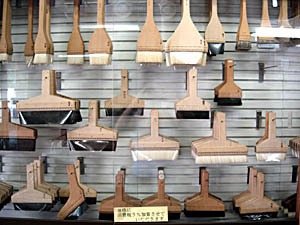 In the Japanese kitchen, brushes are used to coat fish with delicate sauces, or to dust things with flour. The traditional Japanese brush is itself a work of art, and handmade ones in particular show an amazing attention to detail. They're light and easy to work with. 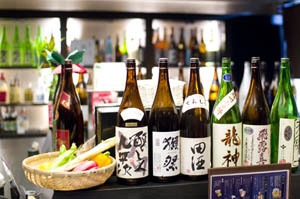 If you're shopping for any of these in Tokyo, there are several places you can go. Kappabashi is the district famous for selling plastic food replicas, but many chefs and savvy home cooks shop there for kitchen goods. Then there's Tsukiji - the world's largest fish market - and Tsukiji's "outer market" includes a number of small shops selling items to help you in the kitchen. 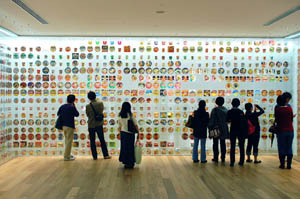 If you're short on time, you might prefer Tokyu Hands or Loft. Tokyu Hands is a well-stocked, upscale do-it-yourself store with branches in Shibuya, Shinjuku and Ikebukuro. Loft is large housewares and furnishings store, with branches in Shibuya and Ikebukuro. Some of the toolkit items can also be found in local supermarkets, although the selection may not be as wide. Regardless of where in the world your kitchen is, having the right tools may inspire you in your cooking. I've found that these tools make life in my Japanese kitchen easier, no matter what cuisine I happen to be cooking.